It’s about six weeks since my last reading diary entry, so it’s about time for another. When last I wrote I was reading and enjoying Dunstan by Conn Iggulden. If you’ve been dropping in here regularly you may have seen my stand-alone review of Dunstan. If not, follow the link! Since then I’ve managed to read completely nine other books. Mind you, one of the nine, Zadie Smith’s The Embassy of Cambodia, is a novella, so quite short. Which is to say only that it’s a quick read. It’s not at all without substance. It’s about a part of modern London, about class and immigration, about relationships between women and men and between races. It may be short but it’s well worth reading and unpacking. Getting through so many books so quickly has been helped by two long journeys. I travelled to and from England at the end of July in part to celebrate my birthday. That gave space and time for a lot of reading. I got through all of John Le Carré’s Legacy of Spies on the outward trip and most of Colm Tóibín’s Brooklyn on the return. 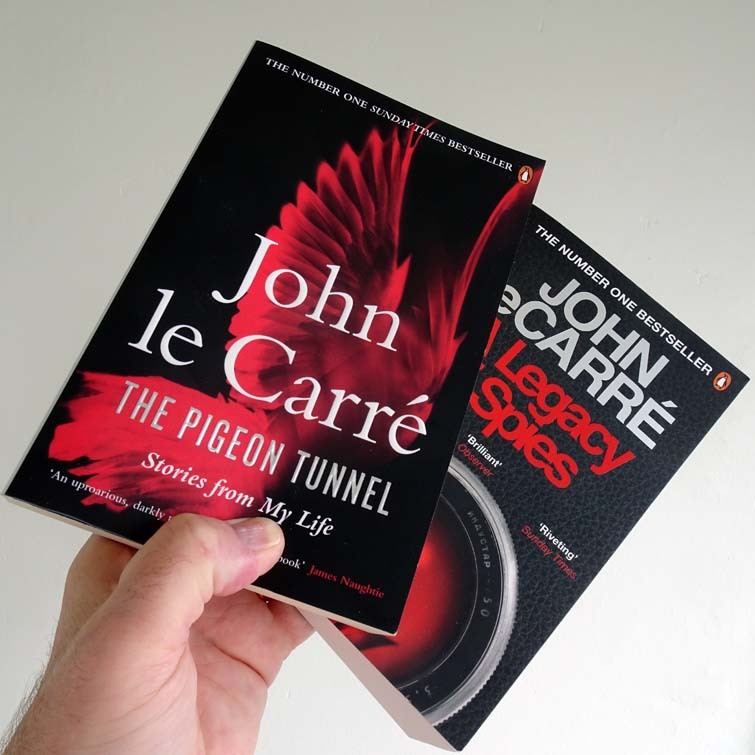 Le Carré is an author of my youth – in the sense that I read many of his earlier novels when I was in my 20s and 30s. I read The Spy Who Came in from the Cold (published in 1963) in the late 70s, and then devoured all the Cold War/Smiley books from The Looking Glass War on. By 1990 I had caught up with Le Carré’s production rate – I read Russia House as a first edition paperback directly after publication. And then – I lost interest. Presumably it had to do with the fall of the Berlin Wall and the end of that era. I did read The Taylor of Panama, but I don’t remember being impressed. And I was never tempted by The Constant Gardener, even after the film. The Spy Who Came in… informs A Legacy of Spies. It’s basically a return visit to the same story, but from the perspective of 50 years or more. One of the characters from The Spy…, Peter Guillam, who shows up in several of the Smiley era books, tells the story. He’s been pulled out of retirement by the modern MI6. A new generation of spies are trying to get to grips with the Cold War shenanigans of Smiley and his team. They are motivated by a political and legal time-bomb that is threatening to go off. In The Spy…, Alec Leamas (a British spy infiltrating the Soviet spy structure in East Germany) and his girlfriend, Liz Gold, end up dead. The mission he was sent on (by George Smiley and Peter Guillam) was compromised – or perhaps this ending was intended all along. Now, Alec’s son and Liz Gold’s daughter are mounting a legal action for compensation. George Smiley is unavailable, so Peter Guillam is going to be sacrificed to save the good name of the Service. Or maybe the Service will protect him. It depends on what they decide is in their best interest. Unfortunately, in my opinion, the book is incomplete. The story is not fully developed. We never meet Liz Gold’s daughter, so her motivation is sketchy. Alec Leamas’s son is better defined, but even his story and his character are not as thoroughly developed as they might be. Peter Guillam as the single point narrator helps lead the story back to the 1960s well, but it makes it difficult to appreciate any other perspectives. Also, the book ends with a deus ex machina moment when George Smiley appears and promises Peter to sort everything out. Le Carré has written better. Continuing with my efforts to read in Swedish I completed two novels in the last six weeks. (Something I find quite amazing actually.) 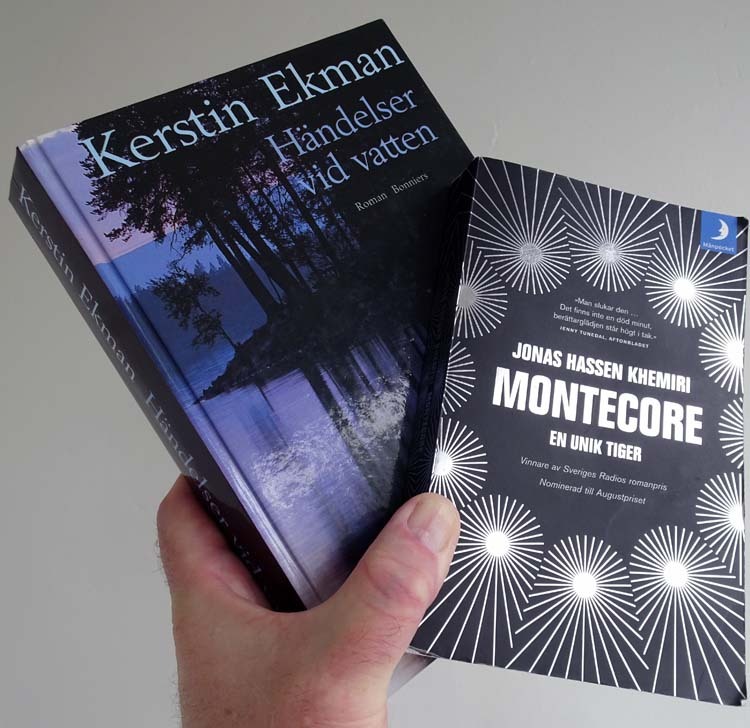 Montecore: En unik tiger by Jonas Hassen Khemiri, and Kerstin Ekman’s Händelser vid vattnet. Montecore was Khemiri’s second novel (after En öga röd). I was originally put off attempting it by hearing from several people that the language is “difficult”. Earlier in the year, though, a friend listed it among her summer reading and encouraged me to try it myself. I found a copy at home – Mrs SC read it when it first came out – and I started. It wasn’t difficult language at all, though I understand why so many Swedes told me otherwise. In fact it’s a linguistic performance at a high level. The book is a fictionalised biography of Khemiri’s father (called Abbas in the book). Presumably it also a fictionalised autobiography of the author himself. It’s written in the form of an exchange of e-mails and other texts between Kadir, who presents himself as Khemiri’s father’s childhood friend, and Khemiri himself. As the book progresses, it seems more and more likely that Kadir is in fact Khemiri’s estranged father Abbas. All these e-mails are a convoluted attempt to build a bridge to his son and rewrite his own history. The most compelling and the funniest element of the book, though, is the language Kadir uses. Swedish forced into a form patterned from French, Arabic and English. Händelser vid vattnet, by contrast, is linguistically very pure, literary Swedish. I had almost more difficulty with the vocabulary here than I did with Montecore. While I was reading, I put it down to the book being set in the Swedish north and making use of dialect. But it doesn’t – or not much. The truth is there are just so many standard literary Swedish words I’m not familiar with. Probably because I haven’t read widely enough. Almost all the translation I do involves a very focused language. Either a precise technical vocabulary for specific business and professional areas, or a more simplified grammar and an everyday vocabulary for school students. I should definitely try to stretch myself by translating more literary Swedish. Händelser vid vattnet (Blackwater in its English translation – see below) is a detective story. Or rather it’s a novel that uses the form of a detective story to tell a very much more complex tale. A tale of character, landscape, history and emotion. It also very significant that almost no one in the book is willing to communicate honestly and fully with almost anyone else. Much of the confusion and lies that drive the story forward depend on this. Actions are misconstrued. There’s a lot of supposition and prejudice. Some people try to shield others from the consequences of what they think they have done. Others behave towards them with fear and anger, again because of what they think they have done. There is a sort of happy ending for some at least. Despite the difficulties I had understanding many words, the story kept me coming back and pushing on. I was almost completely satisfied when I finally got to the end. The only thing that disappointed me was the final explanation for the brutal murder at the beginning of the book. It struck me as perfunctory. But then it was more of a device to drive the story. I started reading Händelser vid vattnet parallel with a completely different book, The Lucky Galah by Tracy Sorensen and wrote about some of the surprising parallels I found in this stand-alone article published a few weeks ago. Apex Hides the Hurt is completely different. It’s an accomplished novel, funny, witty and ironic. It plays with language, but it’s a bit lightweight. 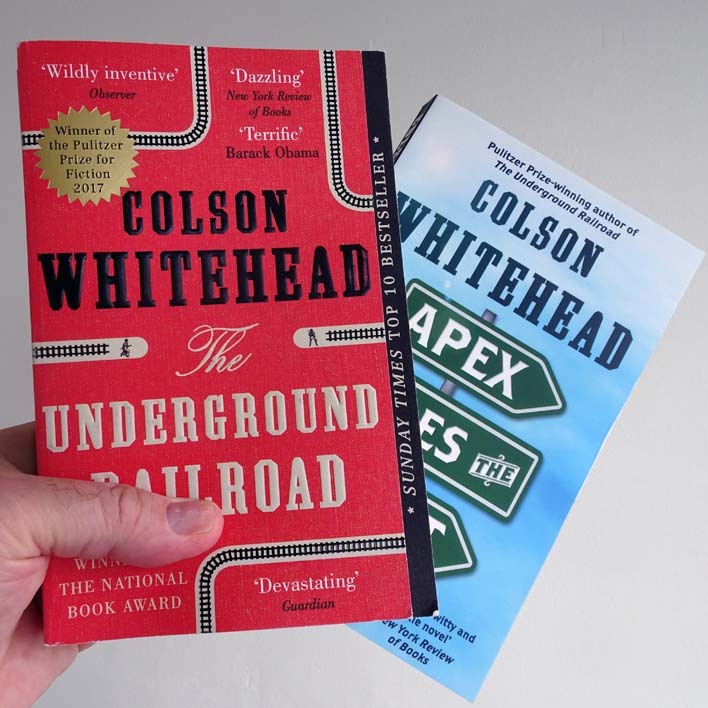 I didn’t read the publishing history at the beginning of the book, and when I picked it up in the bookshop – solely because of the author’s name – I thought it must be new. Now I’ve discovered it is actually 12 years older than I thought, I appreciate it more. The story is about a “nomenclature consultant” – someone who comes up with names for things. He is summoned to the town of Winthrop, which has decided it needs a new name. The county council of three has three different options and cannot come to an agreement. The novel’s protagonist is given the job of choosing the new name for them. The book is an extended discussion of the importance of names and the influence that names have. Names can reveal, but also conceal (as “apex hides the hurt”). The narrator, the nomenclature consultant himself, is unnamed throughout the book. It’s a clever story and an enjoyable read. Here’s a list of the books I’ve read since Dunstan (in the order I finished them). And I’ve added in the other books I mention in the entry. Links on the books are to the relevant pages on Good Reads. The author links are to the authors’ English professional homepages where I’ve been able to find them. Otherwise the author links go to their English Wikipedia entry.